I have a pie to tell you about. It’s a fabulous pie. It’s creamy and crispy and chocablock full of veg. But it’s not quite as fab as my day was today. My gorgeous pup got his collar off. 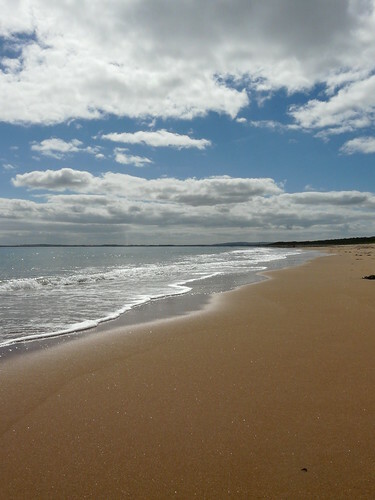 We skipped along a sparkling Dornoch beach in celebration. 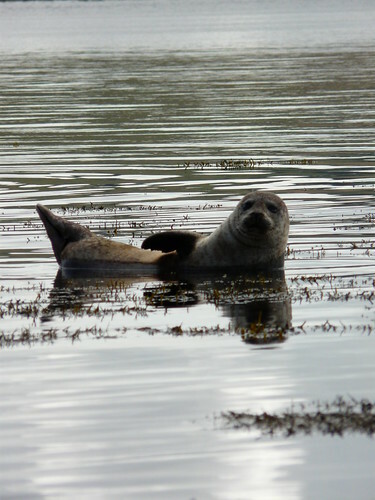 And, to top it all off, the Cromarty seals came out to applaud the sunshine. This entry was posted in dogs, Scotland, Travel. Bookmark the permalink. Looks like a better day than we had in Cornwall. Absolutely gorgeous! Just found your beautiful blog… your pics have made me homesick for my ‘home by default’…Scotland. Have spent the last 6 years trawling back & forth between Tasmania & Aberdeen. The seals & your ‘not so wee’ doggie on the beach are gorgeous. Marco looks like a happy chappy! He is just so adorable 🙂 I cannot believe those seals. Wow! They come so close. We only see them from quite a distance here in Dundee. What lovely creatures they are…how lucky you were. Now. About that pie…you will, I trust, blog it? how gorgeous – did marco find it weird when he first got to the sea? I remember our dog getting really freaked out about the movement of the waves when she was little. 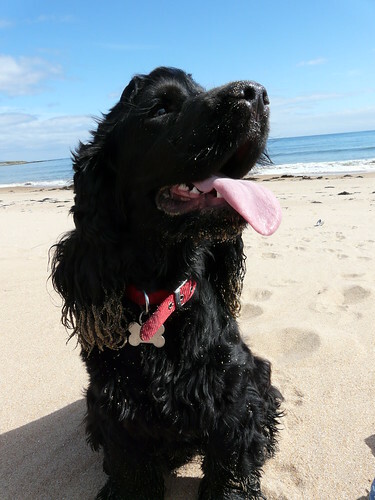 Oh and you will like the story of my sister who has a new dog and recently discovered he was wearing a necklace – when she questioned her little girls she was told that he had been very good so he got to wear a necklace! Who needs collars! Love the seals photos – bet marco was fascinated. Hope to hear about your pie soon! Holler – He is adorable. Even when he’s taking mouth-fulls of soil from my plants and dragging it across the living room as he is right now!!! Lucy – They are. He is. I am. And I certainly will. It was yummy. Johanna – Sort of. 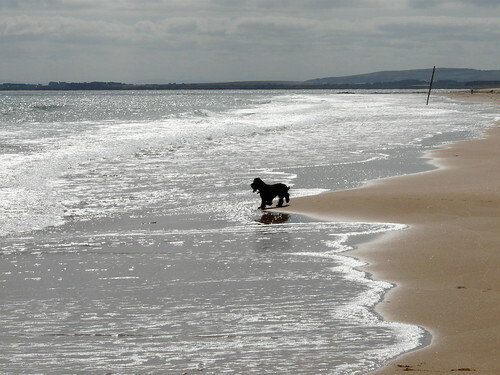 He’s been to the beach before but the waves were always so big he wouldn’t go near the sea. 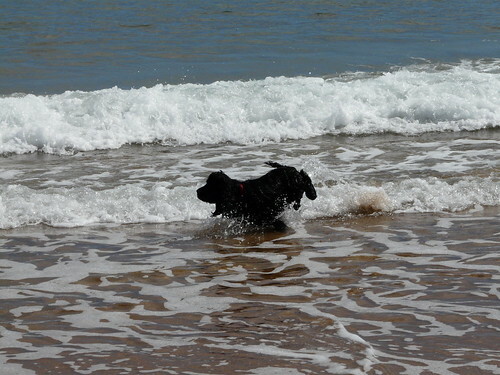 The tide was very gentle at Dornoch and he was brave enough to go in but got a fright each time he was hit by a wave! I was in Scotland last August and your pics of the seals take me straight back!! Your pup looks much happier! Firstly, congratulations to Marco! Secondly, I absolutely adore seals, I remember seeing them all the time in Cornwall as a child. Their big eyes and whiskery faces get me every time. Glad Marco is feeling better. The photographs of the seals made me giggle. wow – gorgeous pics as always Wendy. Marco is looking super cute! Aaaah, they’re all very cute! It’s nice to see marco without his lampshade on, though I have to say he didn’t look like it was cramping his style too much in your last lot of photos! Lynne – Glad to hear it! Helen – It is the whiskers, isn’t it? Kittie – Thank you from us both! Sophie – No, he had a very admirable attitude to the cone. It didn’t stop him having fun at all. Does Marco try digging up your garden plants too or are houseplants the main target? Hi Wendy, some cracking photos on your own site as well, Love that Photo of Marco nosing into the sea, and the pictures of the seals are excellent. See you all soon. Andrew – Thanks! 🙂 I’ve linked to your site just this evening. More folk should see your pics! See you soon. JennDZ – It really was!